Lựa chọn và tạo ra một màu sắc là điều cần thiết cho công việc thiết kế của bạn được tốt hơn . Chúng tôi đã tập hợp một số công cụ tuyệt vời để giúp bạn hoàn thiện cho việc lựa chọn màu sắc của mình . 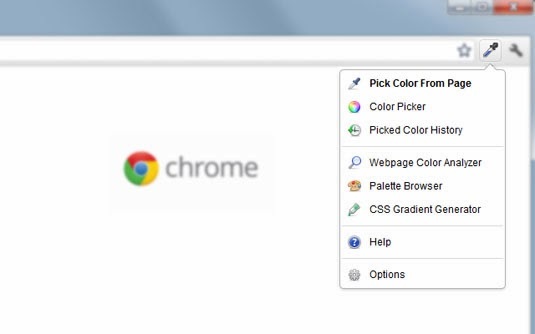 This web designer's tool 'Check my Colours' is designed to check foreground and background colour combinations of all DOM elements, to determine if they provide sufficient contrast when viewed by someone having colour deficits. All the tests are based on the algorithms suggested by the World Wide Web Consortium (W3C). It was created by web designer Giovanni Scala. Although Color Hunter may not look like much at first glance, it's actually a really useful colour tool if you can't find a particular colour. 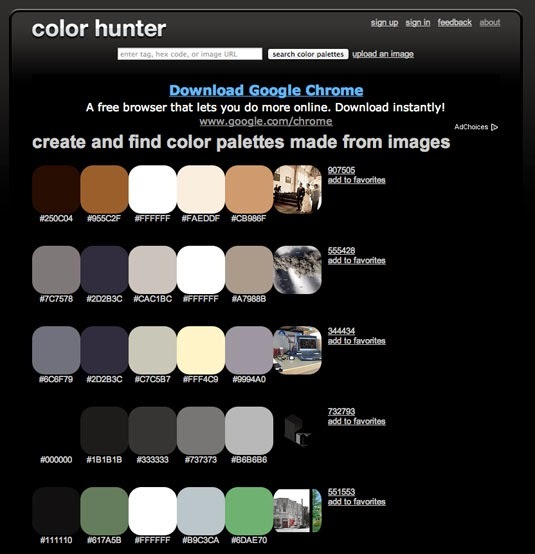 Find an image that you like the look of and then enter it into Color Hunter; the tool will then create a colour palette from your chosen image. 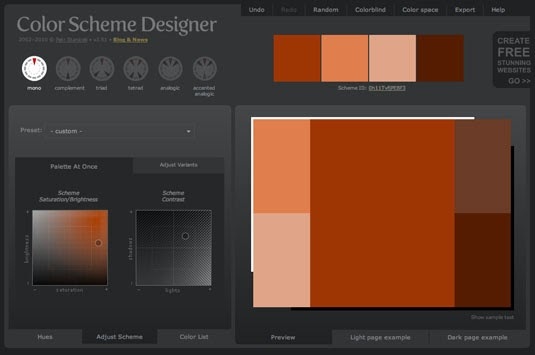 It's a great way to create your own colour theme. Color by HailPixel is a handy little web app if you're a bit of a perfectionist when it comes to getting the colour just right. Hover your mouse anywhere across the screen to nail down your chosen colour, scroll to set your saturation, and the site will give you that all-important hex code for your projects. It's one of the easiest such tools we've ever used. 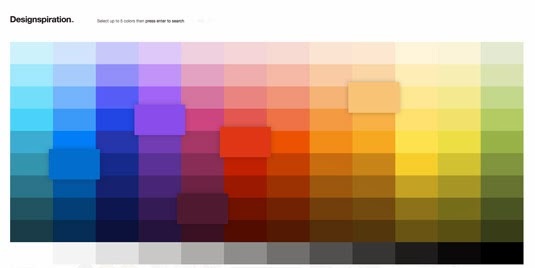 At Designspiration, you can select up to five hues from a useful full-page palette, which gives you the chance to really see what colors you’re looking at. The site will then generate a display of all the images in its database with that colour combination. The hex numbers are prominently displayed, and you can click on them individually. Images can be saved to your collections on the site. The Mudcube Colour Sphere is a handy little colour resource for designers in that it not only provides the hex numbers for each colour; it also helps you to build up a colour scheme from one chosen shade. If you're unsure what colour scheme you should be going for, Mudcube provides a selection of themes from a drop-down menu. 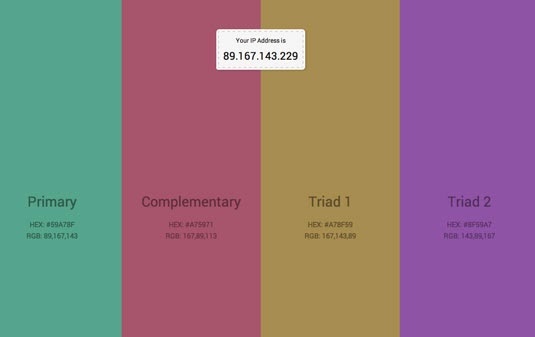 Pretty IP, brought to you by design agency Strange, creates a unique palette of complementary colours based on the numbers in your IP (Internet Protocol) address. 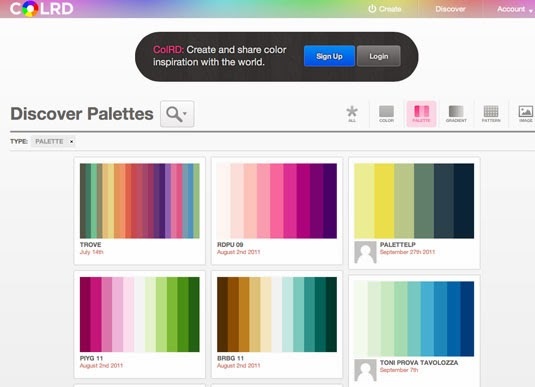 Once you've tried it out on your home and office computers, give it a whirl each time you're connected to a new IP address (a great excuse to try that new coffee shop) and get a burst of colour palette inspiration each time you do so. 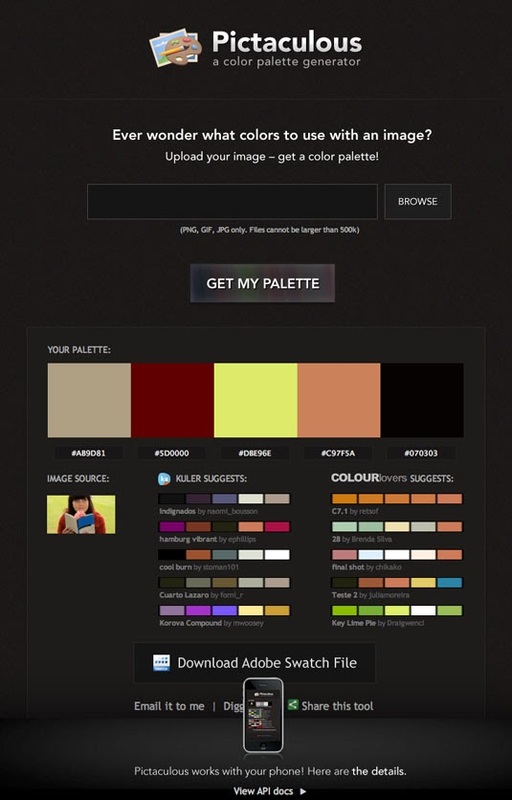 Pic2color is a brilliant tool that enables you to create colour palettes from images and URLs. Simply upload either to the site and it will extract the colour information quickly, before showcasing each shade in a grid format. You can then click on each individual colour to access it's unique HTML code. Sometimes the best way of seeing if a colour scheme will work is via a selection of stock images. All the main stock image librariesoffer this kind of tool, but Shutterstock Spectrum has a particularly nice interface because the images are displayed on such a large scale. 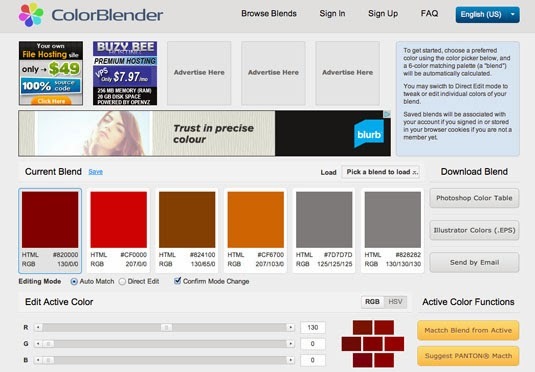 After using the slider to determine your colour search, you can further specify a keyword that determines the subject matter with impressive accuracy. An intriguing option allows you to filter images by their colour balance and brightness. 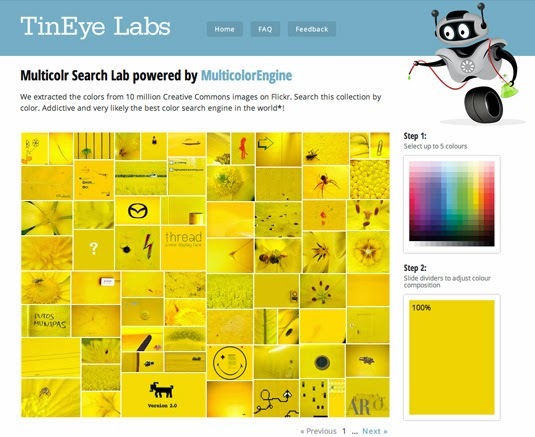 TinEye uses a database of 10 million Creative Commons images harvested from Flickr to let you explore colour combinations. It's probably the fastest way to get free images in the perfect colour combination, and it's also just a fascinating and intuitively designed tool that's a pleasure to use. 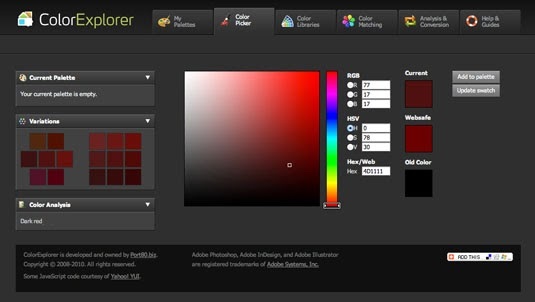 Perhaps the best known of all online colour theme tools, Adobe Kuler has graduated from a simple web-based colour tool to a fully fledged theme generation and sharing resource. Plugins are available for all the main Adobe tools including Photoshop, Illustrator and InDesign, making it a great integrated tool for regular Creative Suite users. 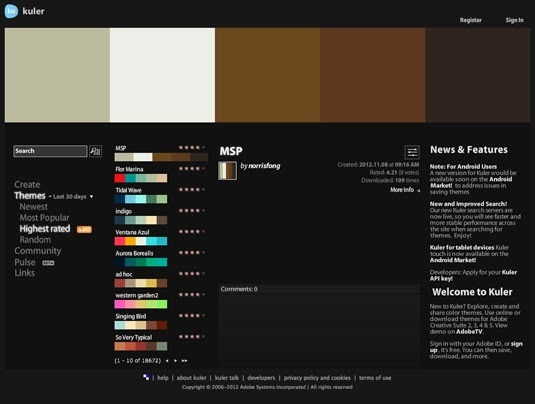 This is possibly one of the most in-depth tools available on the web, offering a wide range of tools to design, customize and analyze your colour palettes. There are, for example, tools that can help you determine the WCAG validity of your colour choices, conversion tools to help you move between different systems, as well as a whole suite of picker and palette generation tools. 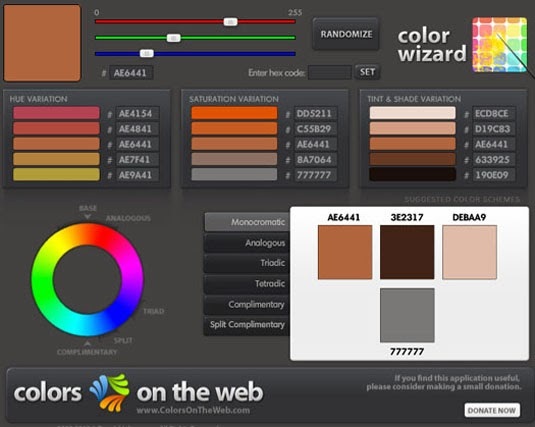 Colors on the Web accepts a single colour in hexadecimal or RGB, and outputs a set of schemes based on different mathematical equations, similar to Kuler. This won’t work on iPad or iPhone though as it uses Flash to power the schemer. COLOURlovers is a community designed around the sharing and appreciation of colours, palettes and patterns. It’s a bit like a Pinterest board for colour, and provides a ready source of inspiration in the palettes shared by its users. 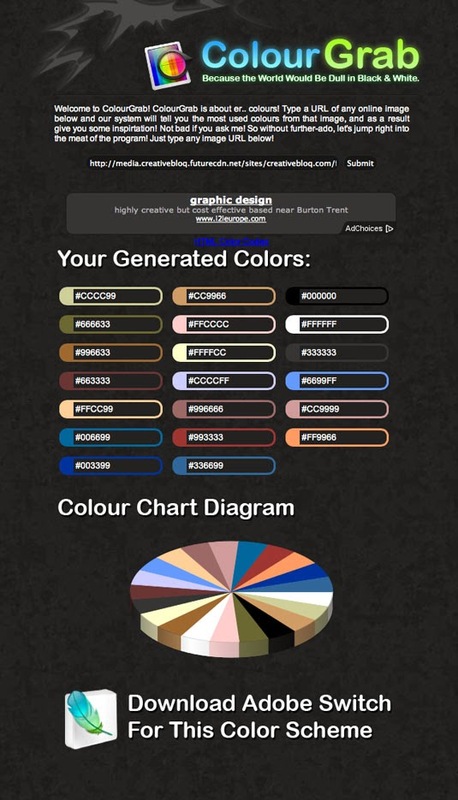 A great tool if you’re a colour aficionado, and like to share your passion. 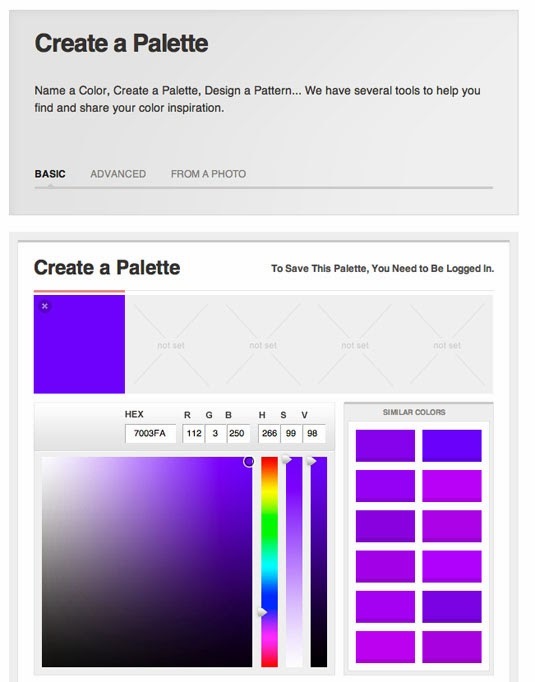 This excellent tool from the makers of MailChimp allows you to upload an image and generate a colour scheme from the colours within. It integrates with some of the other tools featured in our list, bringing you results from Kuler and Colourlovers simultaneously. There’s also a handy Adobe Swatch download for your theme, making it a quick and easy way to grab the colours you need to complement a photo. 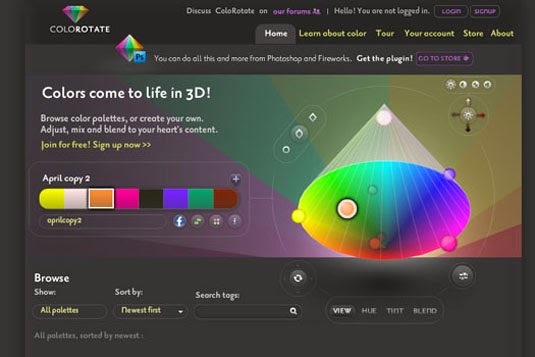 Offering similar functionality to Kuler, but with a nice 3D visualisation of the colour wheels, and the ability to generate more than five colours in a single scheme, ColoRotate can also be integrated directly into some Creative Suite applications, and offers a nice alternative to Adobe’s own offering. This tool is also available as an iPad app, offering a nice integration with Photoshop where it can act as a “colour console”. A handy little tool for generating colours that will work in combination with an existing colour reference you have. 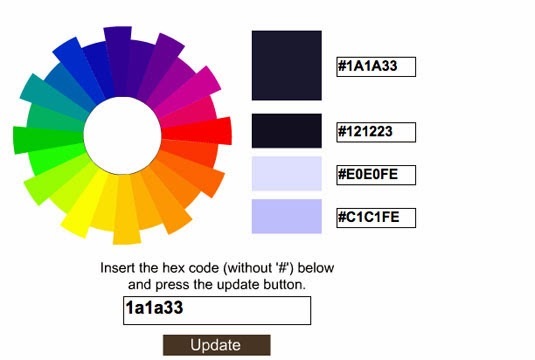 Simply paste in a hexadecimal colour value, and the tool will return a set of pleasing colours that can be used with your base colour and feel like a deliberate theme decision. This online tool provides a similar output to Adobe Kuler, but has some interesting ways of generating colour themes by allowing you to select from the scheme brightness/saturation, and contrast rather than selecting the individual colours that make up the scheme. A range of standard mathematical scheme methods are available including mono, triad, tetrad and analogic. One of the tools within the COLOURlovers site, COPASO is worth highlighting individually as a great all-in-one solution to generating palettes. 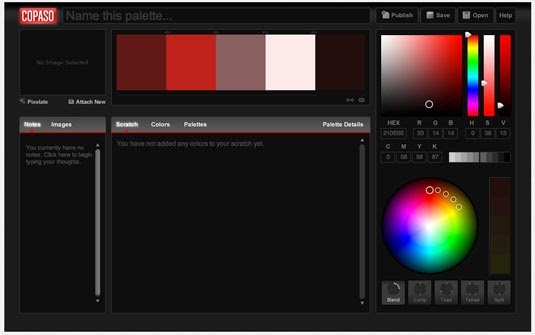 It offers a full range of colour selection tools within a simple interface, including the ability to add notes to your palettes, upload images, enter CMYK references directly and select from a range of different operations to build your colour scheme. 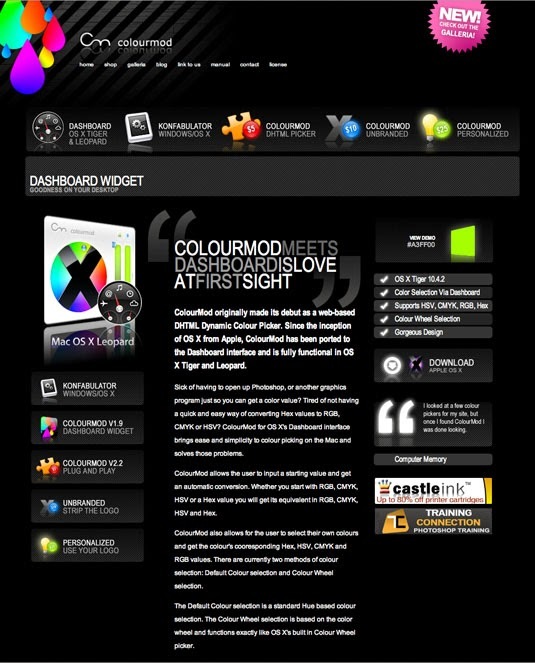 Colourmod is a desktop-based tool that allows you to choose a single colour from within your widget area, whether you’re on a Mac with dashboard, or using Konfabulator on Windows. 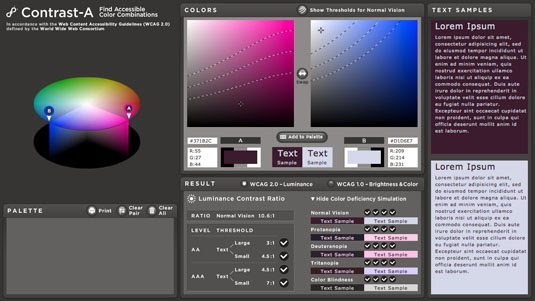 Not directly a colour palette tool as such, but nonetheless it offers a useful way to pick and identify a colour without having to launch a heavy-weight tool. This started out life as a Firefox plugin, but is now also available for Google’s Chrome browser. ColorZilla is an extension that includes a raft of colour-related tools including a colour picker, eye-dropper, css gradient generator and palette browser. 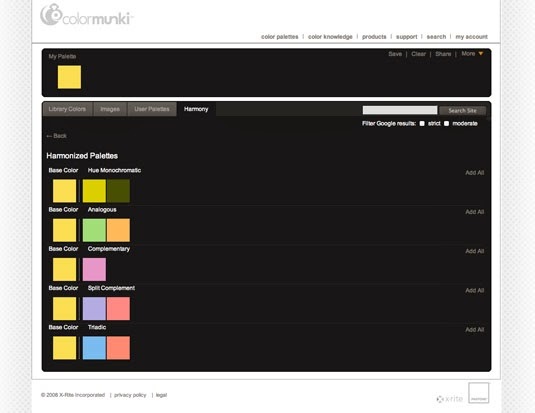 A useful online tool from the makers of the Colormunki colour calibration tool, this online offering allows you to create colour palettes from Pantone swatches using a number of different methodologies to generate pleasing combinations. This pared-down tool offers a unique insight into the colour-from-image analysis that is automated in other tools, allowing you to see the range of colours available within an image, and pick those that appeal to you to form the basis for a theme. Well worth a look, even if it’s not quite as visually polished as some of the other tools available on the web. 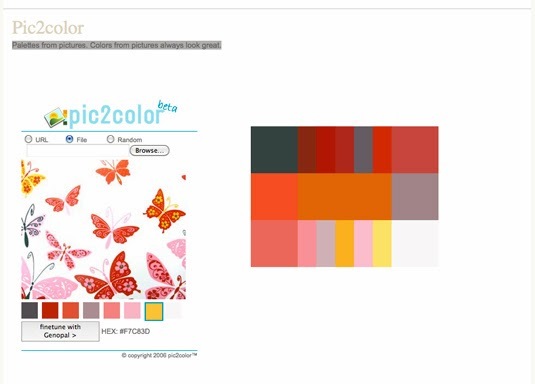 This handy little tool creates a colour palette from any image on the web. Simply paste in the address of the image you’d like to analyze, and the site will grab the image, pull out the colours within it and generate a handy 3D pie chart showing colour usage throughout the image. Not so useful for creating traditional themes, but great for examining images and the colour distribution within them. This handy tool won’t help you choose a colour theme directly, but it will help you analyze your site (or someone else’s) to see what your site looks like rendered in greyscale. This is useful for checking that you’ve achieved sufficient contrast in your colour palette to meet accessibility guidelines, and regulatory compliance. 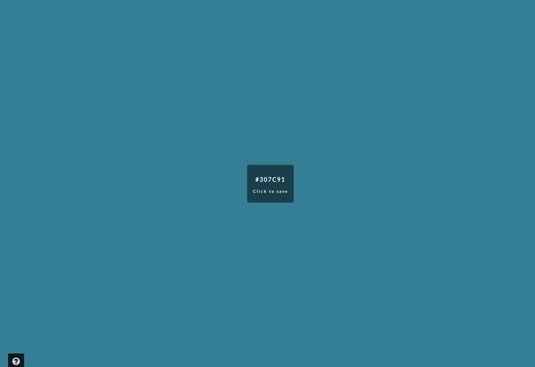 This colourful tool acts as a great source of inspiration by sharing colour palettes generated by its users, as well as patterns, gradients and images. A visual feast for the eyes, it’s not a simple generation tool, but it worth a visit to find some happy discoveries. 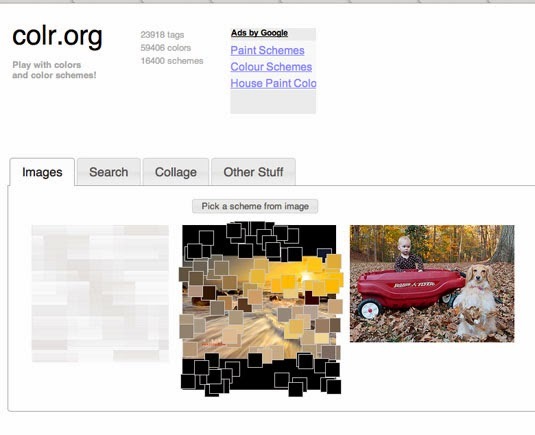 A useful way to quickly grab a colour palette from images uploaded, by searching for an appropriate tag, or by HEX reference. Quick and easy to use, it’s more about being a discovery than a colour generation tool, but offers a nice range of palettes to choose from. 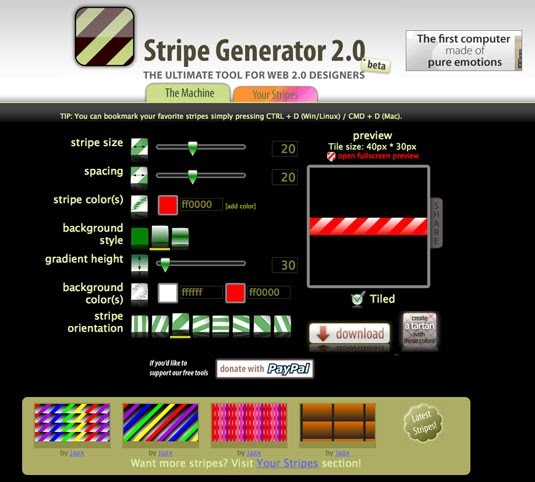 Billed as the "ultimate tool for web 2.0 designers", you might think this tool has had its day (even if it’s all tongue in cheek). Regardless, it’s a useful way to generate pleasing colour combinations, and to generate eye-popping patterns at the same time!